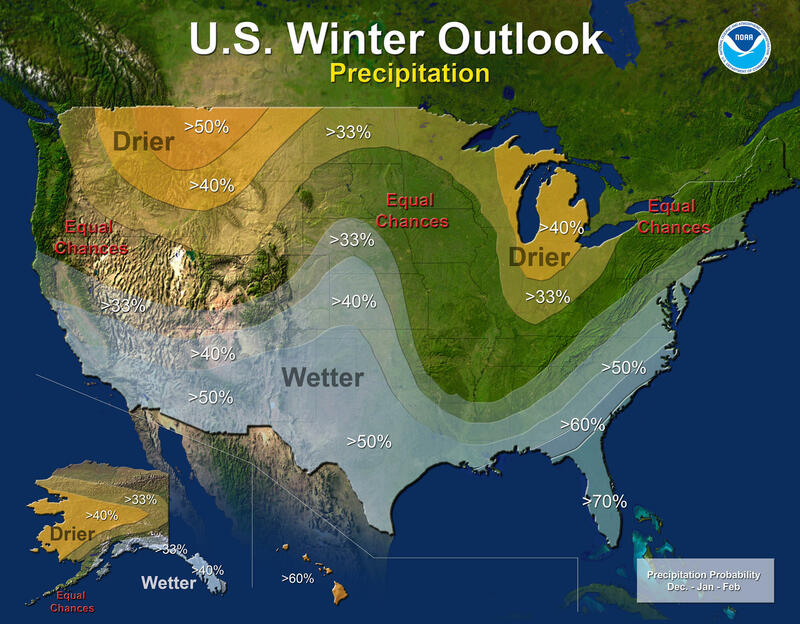 2015 U.S. Winter Outlook showing "wetter-than-average" conditions for Eastern North Carolina due to strong El Nino. This winter is shaping up to be one of the more challenging in her 8 years with the National Weather Service. While Eastern North Carolina winters are known for their fickle nature, residents, especially meteorologists have something extra to contend with: El Nino. El Nino is a periodic warming of sea-surface temperatures in the eastern-equatorial Pacific, which begins on the west coast. El Nino’s effects are felt the world over, though, from arid conditions over Southeast Asia to sopping wet winters throughout the United States. The west coast, and parts of Texas, have had major snowfalls, but El Nino in the south, including Eastern North Carolina, often manifests as periods of heavy rain and swift temperature changes. The region experienced record high temperatures Christmas Day, but snow flurries were reported throughout the Inner Coastal Plain – including Greenville, Kinston, and Goldsboro – and the Outer Banks, earlier this week. El Nino events usually occur every 5 to 7 years. The last hit took place between 2009 and 2010, but was relatively mild compared to what has been noted this year. Flooding along the Mississippi River made international headlines last week, and Pitt, Greene, and Lenoir County have been under flood warnings for more than a week. Flooding has been especially bad along the Neuse River in Kinston. According to Neuseway Center Director, Bobby Cox, the river rose above 17 feet just before the New Year – 14 feet is the threshold for flood levels along that part of the Neuse. He said the river’s crest dipped to 16 feet, 6 inches Thursday. Cox said, though, the heavy rain at the tail end of 2015 has had hindered the park’s ability to offer many of their primary services. Officials say flooding in the cave area is minimal and the animals are fine, but power has been cut to the RV Park on the grounds. Cox said he’s seen flooding like this before, but only during hurricane season. Flooding situations like these are especially frustrating to Cox since unseasonably warm winters would bring families out to the park. Cox even said its impacted construction personnel doing major work on the Queen Street Bridge, which leads to Downtown Kinston’s main thoroughfare. Forecasters believe this year’s El Nino could be one of the strongest on record, comparable to the Biblical like winter of 1997-1998 – during which nation-wide records were broken for precipitation and heat. Pagano said due to unusual activity in the southern jet stream and the polar, northern jet stream pushed further north than usual, the region’s atmospheric roller coaster ride could be just starting. North Carolina has had more than its usual share of moisture over the past few months. According to data from the State Climate Office of North Carolina, the autumn of 2015 was the wettest in more than a century, when records on rainfall were first kept, with a statewide average of 20.3 inches. That’s meant waterlogged crops for local farmers and the crippling damage that came along with it. Millions of dollars’ worth of crops were lost across the state between September and November. Mike Carroll, who works at the Craven County Cooperative Extension branch, said the effect torrential rain has had on local farmers, especially those who grow soy beans and wheat, was severe. Between a record breaking autumn 2015 and an expected onslaught of precipitation during the winter, the repercussions might be felt throughout 2016, not only for crop farmers, but for livestock owners, too. Since cattle and poultry farmers depend on crops to feed their livestock, a crop that’s mostly mold-ridden is unusable, creating scarcity, making vital feed supplies more expensive. But he said it’s difficult to tell how much of an effect systems like El Nino or La Nina – which has the opposite effect as El Nino – will have on our area and its farmers. The soil in Eastern North Carolina is diverse, ranging from rich and naturally damp to sandy and dry. An additional upside to El Nino is it lessens the chance of hurricanes on the Atlantic Basin. In the last major El Nino event in the late 1990s, only four hurricanes developed in the Atlantic, one of them being intense. That’s down from the average of 5.8 hurricanes in normal years. In general, though, Carroll assures, El Nino doesn’t affect areas like Eastern North Carolina as much as the west coast or the Great Plains. He said some parts of the nation, including South Texas and Florida, can expect 3 to 6 inches of excess rainfall during El Nino winters, whereas Eastern North Carolina can expect 1 to 3 inches of extra rainfall during these systems. The effects of this winter won’t be known entirely until long after its finished – perhaps years afterward – but in the short term, Laura Pagano says keep your eyes out for the dangers that come along with periods of heavy rain, especially if you live near a river prone to flooding. The Federal Emergency Management Agency also advices home owners to take photos of, and itemize, their belongings and review their current insurance policy to see what may be covered in the event of a flood.